Pack of 1; Back Length 36cm, Chest Girth 46cm-55cm, Neck 34cm; Measure your dog from the base of the neck to the base of the tail for back length. Flower print dress with soft red trim. A cute and flirty look that is great for any special occasion! Unleash your precious pooch from worries and let her relax in this beautifully designed garden flower dress! With the red trims on the neckline, hem and tank cuffs, this soft cotton dress will be one of her favorite wardrobe essentials. Those little garden flowers are nicely scattered on the dress, which create eye catching patterns. This little dress will keep your pooch exactly where she belongs – in the spotlight no matter she is at home, on the beach or playing at the park. Our Tshirt design is great for small to medium dogs. 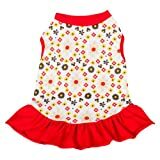 This entry was posted in Dogs and tagged 14/36cm, Back, Blueberry, Clothes, Cotton, Dogs, Dress, Floral, Length, Pack, Sunshine, Yellow by One Boutique. Bookmark the permalink.